We're at a turning point regarding Scottish independence from the United Kingdom. A major turning point, by my reckoning. But we don't know which way the Scots will turn. As I have previously explained (and I suggest reading that post before this one), Scotland will hold a referendum on September 18 to answer a yes/no question: "Should Scotland be an independent country?" If the majority votes "no," then nothing changes and Scotland remains in the U.K. If the majority votes "yes," then Scotland will become an independent country (but within the British commonwealth of nations, such as Australia or Canada). The referendum question seems simple, but the consequences of independence are complex and unknown. Although independence would not come immediately -- some undetermined number of years would pass before Scotland secedes -- much of Scotland's future relationship with the remainder of the U.K. would be negotiated. How open would access and trade be across the border between Scotland and England? Who pays the pensions, and in what system, for current U.K. government employees who are Scottish and live in Scotland? What military materiel from the U.K. would Scotland retain, if any? Who keeps the rights to the oil fields in the North Sea? And so on. Perhaps the most important immediate question is what currency Scotland will use. Should Scotland create its own currency? 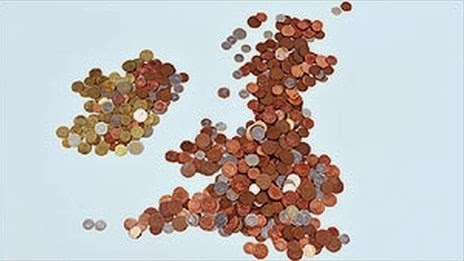 Adopt the Euro? Or stick with the British pound sterling? Polls show a slight majority of Scots identify themselves as either wholly Scottish or primarily Scottish, and not wholly or primarily British or as members of the United Kingdom. That may indicate a sentiment or desire for separation from the United Kingdom. Nevertheless, polls demonstrate economic and currency questions are the number one issue for the voters regarding independence. For major sectors of the economy -- such as financial services, manufacturing, oil and gas, tourism, etc. -- the currency question must be answered. Many voters who might desire independence seem inclined to do so only if they are confident about the practicalities of doing so. Right now, many voters seem to think a vote for independence is too economically risky, or at least decidedly unsettling. Consequently, polls show the "no" vote leading the "yes" vote by roughly 10%, with a sizable "undecided" segment which could possibly tip the balance either way. Scotland's ruling party, the Scottish National Party (SNP), is the main driver behind the independence movement. Last November, they issued a lengthy "white paper" declaring their proposed policies on what they think should happen if Scotland votes for independence. In their white paper the SNP asserted an independent Scotland should retain the British pound sterling as its currency. Moreover, they proposed Scotland should reach an agreement with the remainder of the U.K. about how to share and regulate the currency, including having the Bank of England as Scotland's lender of last resort. Essentially, the SNP avidly seeks independence for Scotland but also a currency union with the rest of the U.K. The SNP's declaration was surprising. Their leader, Alex Salmond, the current First Minister of Scotland, declared back in 1999 that the British pound sterling was a "millstone round Scotland's neck" and Scotland should seek its own currency. While no one seems to argue Scotland should join the Eurozone -- it's still unclear whether the Euro will survive -- it is startling the SNP calls for Scotland to retain the British pound rather than create its own currency. With a currency union, Scotland would surrender its freedom to set its own monetary policy and severely limit its freedom of action on public finance. Of course, creating a currency is complex, cumbersome, and risky. How would a Scottish currency be valued against the U.S. dollar, the British pound, the Euro, etc.? What kind of borrowing power would the Scottish government have? What would interest rates be? Scotland could create its own currency. But there necessarily would be a disruptive transition period which could cause significant economic hardship. Almost certainly, things would get worse before they might get better. Or things could go from bad to to really bad. Remember all those voters who will vote for independence only if the economics seem beneficial? They're the impetus behind the SNP's declaration for seeking a currency union with the U.K. Keeping a unified currency is the safest and smoothest means of transition to independence, even if it leaves Scotland partly tied to the rest of the U.K. Some within the SNP complain that a currency union would leave Scotland as more of a federal entity within a reformulated U.K. instead of a truly independent nation. I'm sure those malcontents are being told to take a gradualist approach: first worry about getting independence, and then in the future they can seek their own separate currency. Now, after all that exposition, let's talk about the turning point: The U.K. just said no. It will not enter into a currency union with Scotland. In a major speech last week -- delivered in Edinburgh, not far from the Scottish parliament, essentially in the lion's den -- the U.K.'s Chancellor of the Exchequer declared that if Scotland became an independent nation, it would not be in the interests of the U.K. to share its currency and its economic policy. Even more significantly, Chancellor George Osborne's declaration is supported not only by the governing Tory party, but also by the other two major parties, the Liberal Democrats (currently in a coalition with the Tories) and Labour (the ardent opposition). That's a united political front against the SNP. According to Osborne, although the rest of the U.K. would suffer from increased transaction costs if Scotland had its own currency, the U.K. would suffer more if its own economic policies had to be negotiated with another country. The transaction costs are merely an inconvenience. A currency union, by contrast, could be economically stultifying, and possibly dangerous. Moreover, why would the U.K. want to take on the financial risk of underwriting the financial institutions of independent Scotland? If Scotland had an economic crisis, the rest of the U.K. would be on the hook to save it. A political commentator pointed out that the combined economies of England, Wales, and Northern Ireland do only 10% of their trade with Scotland, but 40% with countries using the Euro, and 20% with the United States. Thus, it would make more sense for the U.K. to seek a currency union with the U.S., or to adopt the Euro, than to agree to a currency union with Scotland. This move by the Tories, Labour, and Lib Dems is a haymaker to the jaw of the SNP. 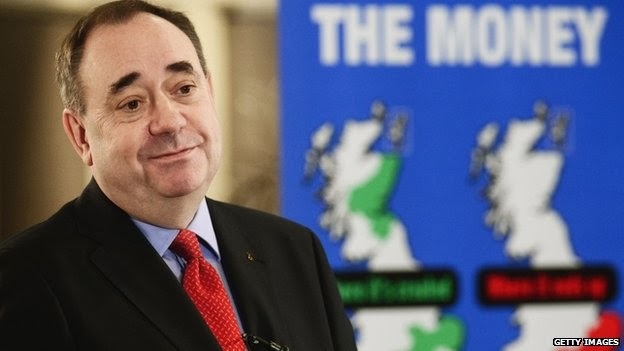 The SNP's leader, Salmond, has responded that Osborne's declaration is a bluff. It is meant to scare Scottish voters. He thinks U.K. businesses would be more than just inconvenienced by a lack of currency union, but instead would feel it as a heavy tax (the "Osborne tax") on their activities. According to Salmond, the costs would run to the hundreds of millions of pounds. He describes Osborne's tactics as "bullying." But Salmond had a punch of his own to throw. He stated that if the U.K. rejected a currency union, then an independent Scotland would not take on any of the national debt owed by the U.K., leaving the U.K. to pay any debt that proportionately would be owed by Scotland. As Salmond argues, the British pound sterling has been built in part by Scots, and they have a right to it: "To be told that we have no rights to assets jointly built up is as insulting as it is demeaning. To be told there are things we can't do will certainly elicit a Scottish response that is as resolute as it is uncomfortable to the No campaign – it is yes, we can." The left-leaning SNP apparently is drawing from the Obama slogan handbook. According to Salmond, under international law the debt of the U.K. was created by the U.K. and if the U.K. continues as an entity (i.e., with England, Wales, and Northern Ireland) then it will still be responsible for that debt. Scotland, on the other hand, will be an independent nation. It will have no duty toward the debt, which is owed by a separate nation. Although the SNP's white paper offered that an independent Scotland would take on its fair share of the U.K.'s debt, Salmond now says it would not do so unless it was in a currency union with the U.K. If Scotland became independent without any national debt, it would have a freer hand economically, with significantly greater borrowing power and less worry from financial ratings agencies. Such a stance could make it easier to implement its own currency. Or, an independent Scotland could keep using the British pound sterling even without a currency union with the U.K. Just as some nations use U.S. dollars as their currency, either officially (e.g., Panama and El Salvador) or unofficially (e.g., parts of Mexico), Scotland could continue to use the U.K.'s currency. That would make it easier for many Scottish businesses, as well as pensioners and others reliant upon the British pound. But it would leave much of Scotland's economics beyond its control, with the U.K. acting in its own best interest without regard for Scotland, or even with deliberate intent to affect Scotland. David Cameron, the U.K.'s Prime Minister, has said the SNP doesn't have a "Plan B" if it can't get Scotland into a currency union with the U.K. His obvious message to Scottish voters is it's too risky to vote for independence. The Tories, Labour, and Lib Dems are ready to play hardball with Scotland and its ruling Scottish National Party. They might try to woo voters, but they'll also bring a hammer down. Salmond says their hardball tactics will backfire. Scots don't like being pushed around by the English (see, e.g., the "Rough Wooing" period during Henry VIII's reign). One of the thrusts of Scottish independence is predicated on the idea that its needs and desires are frequently ignored, downplayed, or deflected by its bigger neighbor to the south. Salmond predicts an upswell in "yes" votes for independence. Just a few days ago, the president of the European Union stated it would be "extremely difficult, if not impossible" for an independent Scotland to join the E.U. A failure to join the E.U. would be a significant blow to Scotland. Trade, travel, and a host of other considerations would be harmed. The E.U. president, Jose Manuel Barroso, said Scotland would need to apply to be a member of the E.U. To be accepted, a new nation must be unanimously approved by all the E.U. 's member states, and Barroso apparently thought such approval would be tough to get. He noted Spain has refused to accept Kosovo, which it regards as a breakaway province from Serbia. Though Barroso did not say so directly, he apparently thinks Spain might have similar concerns regarding Scotland. If you've read my earlier posts about Barcelona, you know Spain struggles with its own province of Catalonia, where a majority of citizens favor independence. Spain may not want a precedent set by Scotland, which could encourage Catalonia. The SNP responded by calling Barroso's remarks "preposterous." They noted Spain's foreign minister has indicated that so long as Scotland departs the U.K. through a politically-agreed process (i.e., the September referendum), then it would not have concerns. Furthermore, Scotland is already a nation -- it's one of four nations within the United Kingdom -- and already has been a part of the E.U. for more than 40 years. By contrast, Kosovo sprang from a nation which was not already part of the E.U. Regardless of his accuracy, Barroso's remarks are a second front on which the SNP must battle. They have predicted an independent Scotland will not face tremendous difficulty in joining the host of international organizations and agreements which it currently enjoys as a member of the U.K. Barroso's statements are a shot across the bow that things may be tougher than the SNP predicts. Between the U.K. and the SNP, who's bluffing, and who's not? Both sides? Neither? Is the U.K. trying to bully the Scots? Will the Scots feel bullied, or simply forewarned? It is hard to tell what's a turning point in political decisions, except in retrospect. But Osborne's speech, and Salmond's response, feels like one.